Adult primary undifferentiated embryonal sarcoma of the liver (UESL) is a rare disease. While the etiology of UESL remains largely unknown, association with systemic inflammatory disorders has been observed. Here, we report a case of UESL in a 46-year-old woman with systemic lupus erythematosus (SLE) and without chronic hepatitis or liver cirrhosis. Systematic review of the publicly available English language medical literature identified only 27 cases of UESL in patients aged >45 years and none with SLE. Our patient presented with abdominal pain and had a 2-year history of SLE. Abdominal ultrasonography and enhanced computed tomography revealed a solid mass in the right lobe of the liver. Presumptive diagnosis of atypical hepatocellular carcinoma was made and the patient was treated with segmentectomy of S5 and S4a and cholecystectomy. The final diagnosis of UESL was made according to the pathology results. Since SLE patients may be at increased risk of malignancy, it is possible that the SLE pathogenesis may have contributed to the development of UESL in our patient. According to this case, UESL should be considered when SLE patients present with hepatic space-occupying lesions. Undifferentiated (embryonal) sarcoma of the liver (UESL; also known as malignant mesenchymoma of the liver) is a malignant hepatic tumor that is composed of undifferentiated mesenchymal cells. The majority of the reported cases occurred in children between the ages of 6 and 15 years [1, 2], but occasional diagnosis of UESL in adult patients (defined in the literature as aged >15 years) have also been reported . UESL in patients aged 45 years or older is extremely rare, and only 27 such cases have been reported in the English language medical literature up to 2012. With the exception of two cases that are not well documented, these cases are summarized in Table 1[3–24]. The etiology of this rare disease remains largely unknown, especially in adult patients. However, a potential association with inflammatory disease has been suggested based upon some cases with co-morbidities, such as CREST syndrome, malaria, community-acquired pneumonia, cancer-related chemotherapy, and multiple sclerosis [6, 8, 12, 15, 22]. 5-FU, 5-fluouracil; Adm, doxorubicin; AFP, α-fetoprotein; ALP, alkaline phosphatase; ALT, alanine aminotransferase; ANED, alive with no evidence of disease; AST, aspartate aminotransferase; AWD, alive with disease; B-ALL, B-lymphoblastic leukemia; CA-125, carbohydrate antigen 125; CAV, cyclophosphamide + Adm + Vcr; CHD, coronary heart of disease; CREST syndrome, calcinosis, Raynaud phenomenon, esophageal dysmotility, sclerodactyly, and telangiectasia syndrome; DOD, dead of disease-related cause; Dtic, decarbazine; Epi, epirubicin; F, female; GGT, γ-glutamyl transpeptidase; HA, hepatic artery; HCC, hepatocellular carcinoma; Ifs, ifosfamide; L, left; Left hep, left hepatectomy; Left lob, left lobectomy; M, male; MAID, Adm + Ifs + Dtic + methylprednisolone; NA, not available; R, right; RT, radiation therapy; RUQA, right upper quadrant abdominal; Rx ext hep, extended right hepatectomy; Rx hep, right hepatectomy; Rx lob, right lobectomy; SLE, systemic lupus erythematosus; TACE, transcatheter arterial chemoembolization; Vcr, vincristine. SLE is a relatively common chronic inflammatory disease that affects multiple organs but only rarely causes serious liver impairment. While SLE has not been previously associated with UESL, it is associated with an increased risk of malignancy, particularly with hepatic cavernous hemangioma, lymphoma, and hepatocellular carcinoma (HCC) [25–27]. Herein, we report a new case of UESL that occurred in a middle-aged female with SLE. The patient had a medical history of steroid hormone therapy to treat the SLE but no medications or co-morbidities related to cancer or liver damage. To the best of our knowledge, this is the first report of a concomitant case of UESL and SLE. No distinctive symptoms, tumor markers, or imaging features were found and UESL diagnosis was based on surgical pathology. In January 2010, a 46-year-old woman presented with a complaint of idiopathic upper abdominal pain that had lasted for about 20 days. Self-report of personal and medical history indicated no recent weight loss, no symptoms or diagnoses of hepatitis or other liver diseases, no drug abuse, and no specific family history of cancer. However, the patient revealed a diagnosis of SLE from 2 years prior, since which she had remained on a prednisone (PSL) regimen of 10 mg/day. Physical examination on admission showed that the patient was well nourished and had no signs of jaundice, icteric sclera, spider naevi, or palmar erythema. The cardiopulmonary examination was unremarkable. Abdominal examination revealed it to be soft and without tenderness or palpable mass. However, palpation of the hepatic region elicited pain, so that no further examination could be performed below the xiphoid and the right lower costal margin of the liver. Laboratory tests showed blood cell counts, liver function, renal function, and coagulation time within the normal ranges. Tests for hepatitis B and C viruses were negative. Tests for the tumor markers carcinoembryonic antigen (CEA; general cancer), α-fetoprotein (AFP; HCC), and cancer antigen 19–9 (CA19-9; gastrointestinal cancer) were normal. The test for the autoimmune disorder marker antinuclear antibody (ANA) was positive at a titer of 1:320. Tests for deficiencies in the complement system indicated normal activity, with C3 being 1.08 g/L(0.74-1.4 g/L) and C4 being 0.186 g/L(0.12-0.36 g/L). Likewise, quantitative immunoglobulin (Ig) testing indicated that the immune system status was normal, as indicated by IgA at 3.86 g/L(0.97-3.2 g/L), IgM at 0.34 g/L(0.4-1.59 g/L), and IgG at 10.10 g/L(6.95-15.15 g/L). No antibodies against double-stranded DNA, ribonucleoprotein, Smith antigen, SSA/Ro, SSB/La, SCl-70, or JO-1 were detected. 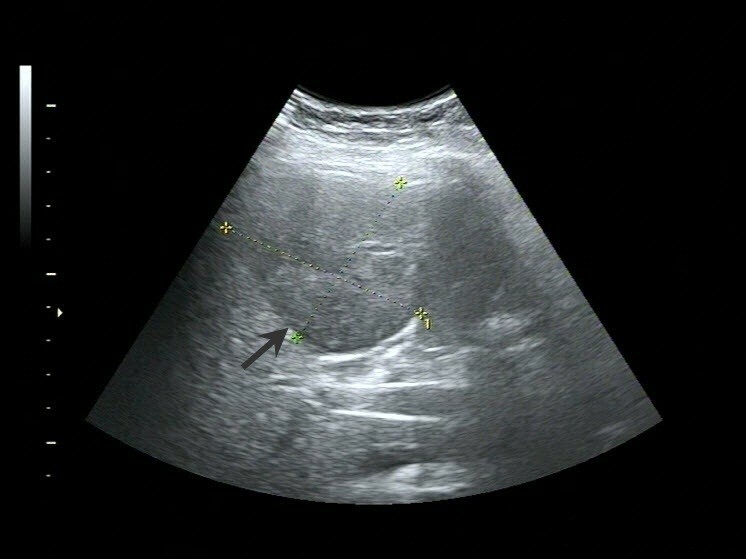 Abdominal ultrasound examination revealed a 6.3 × 5.5 cm solid lesion in the right lobe of the liver. The lesion showed inhomogeneous echogenicity, with iso-and hypo-echoicareas, and had indistinct boundaries (Figure 1). 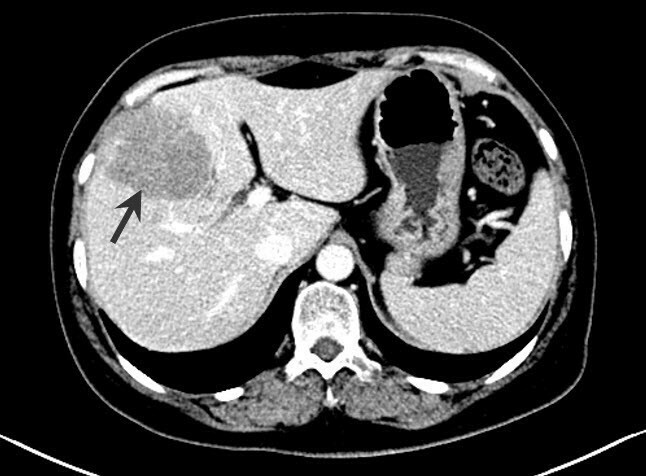 Abdominal contrast-enhanced computed tomography (CT) revealed an irregularly shaped space-occupying lesion in the right anterior lobe of the liver that measured 6.0 × 5.0 cm. During the unenhanced phase, the lesion appeared slightly hypodense (CT value of 42 HU); during the hepatic arterial phase, the enhancement of the lesion was obviously lower than that of the surrounding tissues (Figure 2). Delayed scanning showed that the enhancement of the lesion did gradually increase but always remained lower than that of the surrounding tissues. The overall imaging characteristics of the lesion were non-specific and the differential diagnoses that were considered included secondary hepatic neoplasm, biliary neoplasm, and atypical hepatocellular carcinoma. Colonoscopy and gastroscopy examinations were performed and yielded normal findings. Similarly, the chest X-ray and whole body bone scan was normal. Transverse ultrasound scan of the upper abdomen showing a non-homogeneous, iso-hypoechoic and solid lesion in the right lobe of the liver. Contrast-enhanced CT axial section of the abdomen showing ahypodense lesion in the right lobe of the liver. The lesion is differentiated from the surrounding hepatic tissue by lower enhancement. Based upon these collected findings, the initial diagnosis was primary liver neoplasm. As such, segmentectomy of S5 and S4a and cholecystectomy were performed under general anesthesia. During the operation, a solid mass with 6 cm diameter was located in the right anterior lobe of the liver. Exploration of the left hepatic lobe and abdominal cavity found a normal structure and no other tumors. Finally, a partial hepatectomy was carried out to remove the entire lesion from the right lobe, which included a sufficient portion of the normal liver tissue to help ensure complete resection; the resection status was confirmed as R0. Histological analysis of the resection specimen defined the 6.5 × 6 × 5 cm lesion as well circumscribed, lobulated and soft, with yellowish-brown and grayish-white coloration. Observation of a gross cross-sectional area of the lesion showed dark red coloration and a small variegated portion. 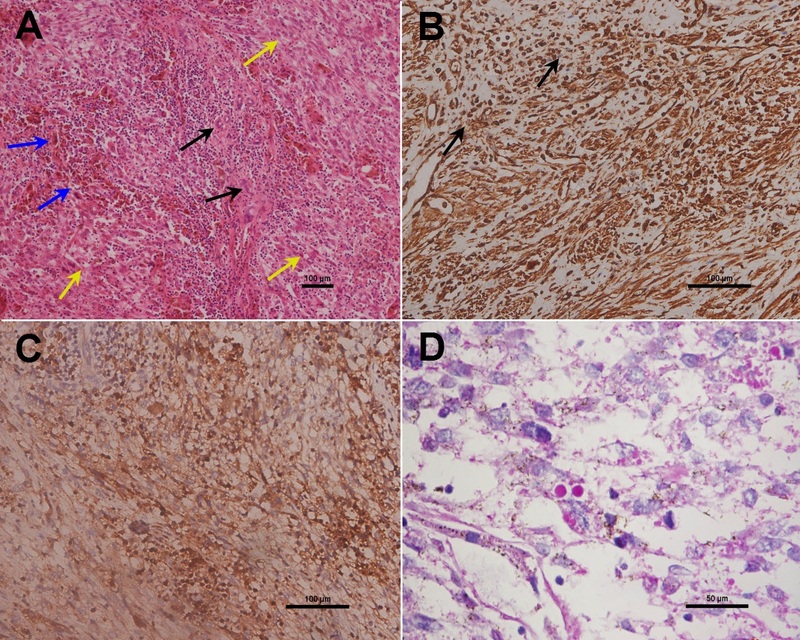 Microscopic examination showed that the tumor cells were spindle- or polygonal-shaped, arranged in a fascicular pattern, and distributed diffusely throughout the mass (yellow arrows); in addition, multinucleate giant cells (blue arrows), remnants of small bile ducts (black arrows), and chronic inflammatory cell infiltration were also detected in the tumor tissue (Figure 3A). Immunohistochemical staining for cancer markers defined the tumor as positive for vimentin, alpha-1-antitrypsin (AAT), and periodic acid-Schiff (PAS) (Figure 3B, 3C, 3D), but negative for cytokeratin (CK)AE1/AE3, S-100, epithelial membrane antigen (EMA), alpha-smooth muscle actin (SMA), myogeinc differentiation 1 (Myo D1), CK8/18, hepatocyte paraffin 1, human melanoma black-45, melan-A, CD117, synaptophysin, anaplastic lymphoma kinase, CD21, CD35, CD23, and CD34. The tumor cells were positive for vimentin and AAT, which indicated that the tumor was composed of undifferentiated mensenchymal cells. The immunoreactive negative findings for CK, S-100, EMA, alpha-SMA, and MyoD1 indicated there was no epithelium, nervous, smooth muscle, or striate muscle differentiation. The immunoreactive negative findings for the other markers excluded hepatocellular carcinoma, melanoma, gastrointestinal stromal tumor, neuroendocrine tumor, lymphoma, and dendritic cell tumor. The final diagnosis based on these pathology findings was UESL. Histological findings and immunohistochemical expression in UESL. (A) H&E stained sections showing the tumor cells as spindle- or polygonal-shaped with fascicular arrangement (yellow arrows). In addition, multinucleate giant cells (blue arrows), remnants of small bile ducts (black arrows), and chronic inflammatory cells infiltration are shown in the tumor tissue (magnification: 100×). (B, C) Immunohistochemistry analysis of UESL showing positivity for (B) vimentin and (C) AAT (magnification: 200×). In (B), black arrows indicate the coutnerstained cell nuclei. (D) Cells containing eosinophilic cytoplasmic granules staining positive for PAS are shown (magnification: 400×). The patient recovered from surgery without complication and was discharged on day 12 postsurgery. No adjuvant chemotherapy or transcatheter arterial chemoembolization (TACE) was performed according to the patient’s insistence on only taking oral traditional Chinese medicines. At the 6-month follow-up, an unresectable tumor was detected, but the patient again refused palliative therapy (chemotherapy or TACE). The patient died 1 year later. As a rare disease with few case reports in the literature, the etiology, cellular origin, and carcinogenic mechanisms of UESL remain unclear. In most cases of UESL, no pre-existing liver disease is detected ; however, some of the middle-aged and elderly patients diagnosed with UESL also suffered from multiple sclerosis , concomitant coronary heart disease , CREST syndrome , or community-acquired pneumonia . In addition, some of these patients have a past history of malaria  or cancer, including patients who have undergone resection for colonic carcinoma  or chemotherapy for ovarian cancer . Interestingly, only one of the previously reported adult UESL cases aged >45 years had hepatitis B cirrhosis and HCC in the left lobe (Table 1), which may have contributed to the development of the UESL. The new UESL adult case described herein was unique for the concomitant SLE disease status and history of steroid therapy. The clinical characteristics of SLE-associated liver disorders include hepatomegaly, jaundice, and elevated liver enzyme levels; it is unknown, however, whether these complications are directly induced by the SLE pathogenic process itself, the drugs used to treat SLE, or secondary thrombotic events induced by SLE [25–27]. Both benign (for example, hemangioma) and malignant lesions have been found in the livers of patients with SLE and may be related to a localized chronic inflammatory state. Unfortunately, these hepatic lesions may be difficult to distinguish radiographically, and it may be necessary to perform a biopsy to exclude a neoplasm diagnosis. Review of the middle-aged and elderly UESL cases reveals some potential distinguishing characteristics from the UESL pediatric cases. Where the pediatric cases of UESL show equal distribution among boys and girls , there are more female cases among the middle-aged and elderly patients with a female-to-male ratio of 3.5:1 (Table 1). In addition, where the pediatric UESL cases often present with a large palpable mass with or without abdominal pain, the middle-aged and elderly patients often have non-specific symptoms and signs. The most frequently reported complaints in the older population are abdominal pain or discomfort and detection of an abdominal mass. However, in both the pediatric and older adult populations, the lesions tend to be located in the right lobe of the liver. Further consideration of the adult cases in the literature indicated that most patients have normal laboratory results and partial increase in the level of serum alkaline phosphatase (ALP). Only the patients with concomitant hepatitis-related cirrhosis or HCC showed elevated serum AFP and another patient with elevated serum CA-125 [15, 20]. According to the reported ultrasound findings for these patients, >80% of UESL are solid. However, CT and magnetic resonance imaging analyses revealed punctate regions that were identified as liquified necroses and blood clots in one patient . In the new case described herein, ultrasound examination revealed an inhomogeneous iso-hypoechoic solid lesion and CT showed an avacular entity visibly different from the surrounding hepatic tissues. The histopathological features of UESL are also slightly different between the pediatric patients and the middle-aged and elderly patients. Unlike the UESL of pediatric patients, that of older patients tends to have a less prominent myxoid component and show at least a partial smooth muscle phenotype . Moreover, the older adult UESL are diffusely positive for vimentin and AAT, and focally positive for cytokeratin, desmin, SMA, muscle-specific actin, CD68, myoglobin, non-specific enolase, S-100, and CD34 . It has been reported that >80% of the UESL tumor cells overexpress p53 and suggested that the p53 pathway may plays a role in the disease onset in older adult patients . Unfortunately, the limited number of UESL patients has also hindered attempts to understand the pathogenesis of this potentially life-threatening disease and to develop preventive strategies and effective therapies. Prognosis of UESL remains poor, and the median survival is <1 year after diagnosis . Currently, the most effective therapeutic intervention is complete surgical resection or liver transplantation plus pre- and/or postoperative systemic chemotherapy [29, 30]. Indeed, there are reports of prolonged survival in UESL patients (both children and adults) with radical operation followed by adjuvant chemotherapy [2, 29]. Recently, May et al. reported that five pediatric UESL patients treated with a uniform approach of resection followed by adjuvant chemotherapy (VAC therapy) and radiation (as indicated on a case-by-case basis) achieved disease-free status and that the median length of their first remission was 53 months . TACE is another choice of adjuvant therapy for liver cancer patients. Although the therapeutic effect of a single TACE application did not achieve good results for resolving the hypovascularity of most UESL patients, a small case series report indicated that TACE after complete resection of UESL improved the survival time , suggesting that some UESL cases might be highly sensitive to TACE. Adding more cases to the published literature may improve our ability to diagnose and manage UESL. In conclusion, we report a case of primary UESL concomitant with SLE in a middle-aged female patient without established chronic liver disease. The patient had no specific symptoms and no distinguishing findings for tumor markers or cellular and tissue structures. Final diagnosis was made by surgical pathology findings, although the precise etiology of UESL in this SLE patient remains unknown. It is possible that the long-term steroid therapy and chronic immune disorder may have contributed to disease onset or promoted its progression. We thank Medjaden Bioscience Limited for assisting in the preparation of this manuscript. CJ, SP, FX, YX, and YZ prepared the manuscript and the literature search; CJ drafted the manuscript; CD and XB corrected and revised the manuscript; CD and CJ treated and observed the patient; XW provided the radiographic and ultrasound images; WZ performed the histopathological and immunohistochemical examinations. All authors read and approved the final manuscript.